Who doesn’t love brainstorming meetings? Your whole team in one room, pouring out their creativity – it’s the dream. But facilitating a brainstorming session is hard work. Here’s an agenda for brainstorming meetings to get you started for your next session. Click here to jump to a SoapBox brainstorming meeting agenda template! Before you get into the meat of a brainstorming session, make sure everyone knows what the goal of the meeting is. Remind everyone to keep the goal top of mind throughout the activities, round robin and whole meeting. With brainstorming meetings, it’s not uncommon for things to go off the rails or on lengthy tangents. Reiterating your mission first off with keep the meeting focused and the conversations productive. Sets times for the rest of your agenda i.e. 10 minutes for the activity, 15 for the round robin, etc. The ultimate question: With unlimited time, resources, people, etc. what are three things you would do to tackle this goal? Timed idea lists: In small groups (and within a time limit), have teams write down all of their ideas, wild, or conservative. The goal is to have as many ideas on the table within the set time frame. Once you’re finished, give the teams another set amount of time to cull out the good and bad ideas from their lists. Go around the room and give everyone a set amount of time to share their ideas. This can come after you got the creative juices flowing in the activity, or if you didn’t do an activity (i.e. if your brainstorming meeting agenda is more geared towards everyone coming to the meeting having done their own brainstorming beforehand) then you can jump right into your round robin. Your job as facilitator is to listen, and poke and prod ideas. Make sure you have detailed notes and can tick this agenda item off having a complete list of ideas from everyone in the meeting. You might save this for after the meeting and use an employee idea tool to allow employees to vote anonymously on the ideas they love, or you might do this right in your brainstorming meeting. We’ve found that doing this after a meeting allows employees to digest and be more thoughtful about theirs and others’ ideas. As with any meeting agenda, you want to make sure next steps and action items from the meeting are clear. It’s important here to reiterate the objective of the meeting and whether or not you’ve made progress on what you’re trying to achieve. Assign next steps to individuals and make sure you have clear deadlines and expectations. Every brainstorm session will run differently given the objectives, your team dynamics and how much time you have. 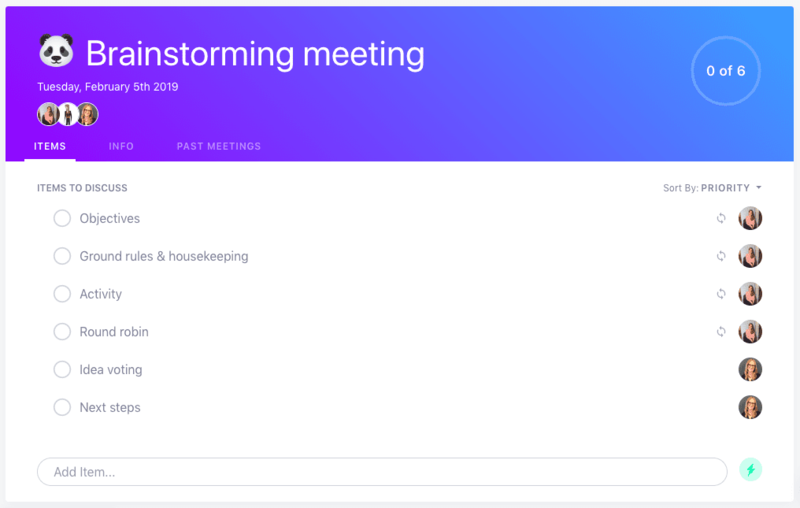 This brainstorming meeting agenda template may not be for everyone, but it’s a great starting point to kick off your next brainstorming session.